The following was written by Josh Glasstetter in American City. Right now, the city is inadvertently letting sidewalk scofflaws off the hook. If a sidewalk isn’t cleared, the city is supposed to clear it and charge the cost to the responsible party—plus a $25 maximum fine. That sounds good in theory, but the city simply doesn’t have a shovel-wielding army to unleash on city sidewalks. The result is that many sidewalks go uncleared, and nobody pays for it—except for the city’s pedestrians. Washington needs an ordinance that has teeth and can be enforced. If some residents, landlords, and business owners are unwilling to clear their sidewalks, then the city should be able to issue citations akin to parking tickets. The police and public works employees clearly have their hands full during snowstorms, so citations should be issued primarily by other city employees (e.g. parking enforcement staff). And the city could prioritize enforcement by relying largely on tips from 311. I, for one, would eagerly phone in a report about about a grocery store near me—fully staffed and open for business, but with unshoveled sidewalks—or the gas stations I’ve passed with plowed and salted lots but unshoveled sidewalks. But without a revised law on the books, there’s little any pedestrian can do but trudge on in disgust. You can read the full story here. Do you agree? 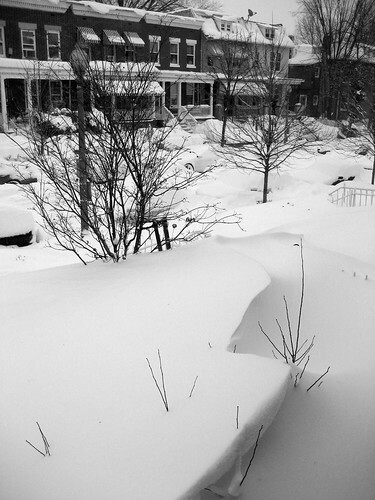 Does DC need to change its shoveling laws?